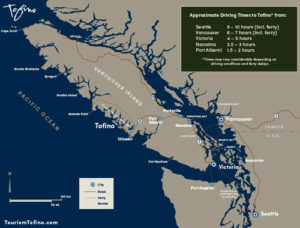 There are a number of ways to explore all that Tofino has to offer. Find the transportation options that best suit you. Leave your vehicle and get on the bus! This summer shuttle runs between Tofino’s village core and the Cox Bay Visitor Centre. Riders can hop on and off the bus at any stop – and surfboards are welcome. The shuttle is supported through a blend of Resort Municipality Initiative and Federal Gas Tax Agreement funding. 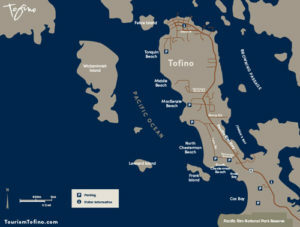 The District of Tofino contracts locally-owned Tofino Bus to operate the service. If you’re flying directly into the Tofino-Long Beach Airport (YAZ), Budget Car Rental maintains a small fleet of vehicles. We recommend booking your rental ahead of arrival. 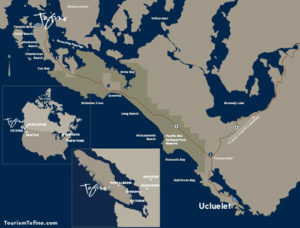 Tofino Bus offers transportation in & out of Tofino to Ucluelet, Port Alberni & beyond with a set schedule. TikiBus offers an on-demand, flexible route service. Please contact them directly (below) for more info. 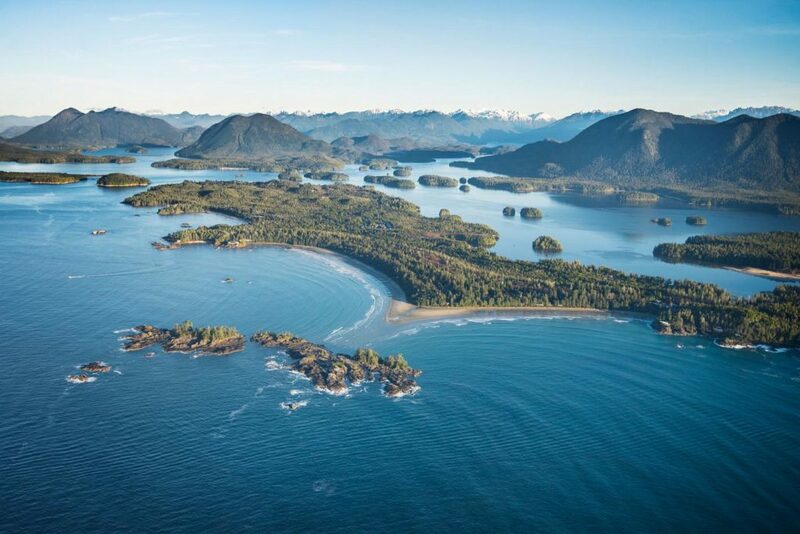 Access remote points throughout Clayoquot Sound, along with breathtaking views, by seaplane or helicopter. Need a lift within Tofino, or to another destination? Our locally-owned taxi and shuttle providers are here to help. 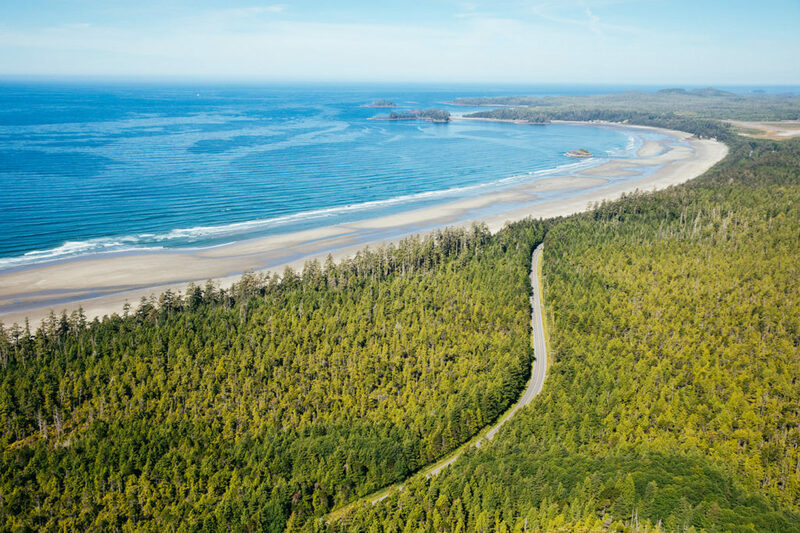 Tofino’s coastal temperate climate allows for cycling throughout the year! Do as many of the local residents do and ride to town or to the beaches on the Multi-Use Path. In Town: There’s lots happening in downtown Tofino. Because of that, parking is limited. To keep things running smoothly, keep an eye on time limit signs and respect business, loading and residential parking zones. Also: remember that parking facing the wrong way will get you a ticket in Canada. Recreational Vehicles: Recreational Vehicle (RV) parking is available in town but limited to designated areas. 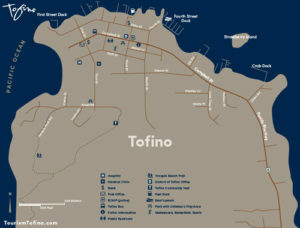 Follow directional signage to find the appropriate locations, or see the District of Tofino’s parking map here. Pay Parking: Pay parking for vehicles (including RVs) is available adjacent to the Municipal Office at 121 Third Street, see map. Don’t have a car or want unlimited time to look around? Check out our alternative transportation options here. At the beaches: Our beaches are popular, especially in the heat of summer or when there’s good surf. Parking lots can fill quickly but, in some cases, overflow street parking is available. You’ll see signage at acceptable parking areas. Please park accordingly and respect residential driveways and local traffic flow. Pacific Rim National Park Reserve: Beginning again on January 1st, 2018, Park use passes are required for access and parking to Pacific Rim National Park Reserve. Hourly and day pass tickets are available for purchase at machines in designated parking areas. Annual passes are available at the Park Administration Centre year-round and seasonally at the Kwistis Visitor Centre at Wickanninish Beach. The sani-station in Tofino is located at the Co-op gas station and the fee is a total of $5.60. If you also purchase gas, then the use of the sani-dump is free. Green Point campground in Pacific Rim National Park Reserve has one, reserved for on-site campers.